We recently had the pleasure of attending the Eileen Fisher Women CEOs of B Corps conference in New York, and were so inspired by the women around us that we felt compelled to relaunch one of our resources for women in leadership. 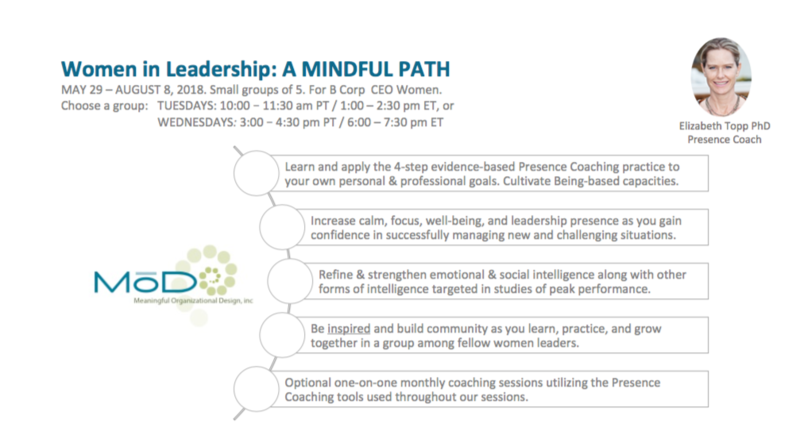 As part of our Executive and Presence Coaching Services we are happy to offer Women in Leadership Coaching: A Mindful Path for CEOS of certified B Corporations. The sense of loneliness can take wind out of our sails. We don’t need that. Research shows that we’re willing to stretch beyond our capacities over and over again if we feel a sense of support, and that someone’s got our back. So … let’s make that happen. Meaningful Organizational Design, Inc. is offering small group coaching groups for Women CEOs running B Corps. Groups will consist of 5 women and meet for 90 minutes twice per month for 3 months. Commitment: Six meetings – every other week for 3 months. Hopefully groups are stable for one year. Each quarter participants will establish new stretch-goals. Cost: $500 per quarter (3 months) with the intention that groups will continue for one year. 5. Learn STOP – OBSERVE – ALIGN – ALLOW, an evidence-based 4-step coaching methodology based on mindfulness and flow theory called Presence Coaching. Presence Coaching has been shown to accelerate growth and development, support the clarification of values and priorities, and enhance well-being. Participants will learn a counter-intuitive approach to goal-attainment, utilizing as a primary practice a conscious deepening of one’s ‘quality of relating’ to life. We will learn and practice being more present to ourselves, others, and our environment. We will practice cultivating a meaningful, purposeful, and rewarding life through deep and generous listening and the capacity for deep acceptance, vitality, and joy. The purpose is to support women leaders to thrive by integrating both masculine and feminine Ways of Being. Flow theory and analysis will direct us, while Mindfulness and Presence practices allow us to settle deeply in ground of the present moment. It is here we gather valuable wisdom and insight, and here where we discover powerful and sustainable forces within us. Then, together, we move mountains. 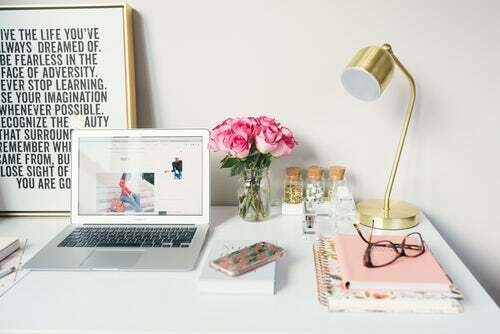 This coaching group will give you an opportunity to get present to your life and work, reflect, center yourself, and gather wisdom from other women. We will learn together how to balance our modern lives and careers, and support one another as we lead purpose-driven enterprises. The world is calling for change as we move forward mindfully and meaningfully together, so, won’t you join us? Send us a note on our contact page to register. We can’t wait to meet you.